This story originally appeared on Jan. 19, 2014. It’s a safe bet to say most people outgrew their fascination with playing in mud sometime in elementary school. Perhaps even fewer would consider it a likely weapon of war. But in the 1960s, the United States began to look seriously at mud—yes, mud—as a way of preventing the North Vietnamese from sneaking soldiers and equipment into South Vietnam. The story begins following the 1954 Geneva Accords, which divided Vietnam into two states. The North Vietnamese government sought to reunify the country under communist leadership, and proceeded to arm and supply a guerrilla movement in South Vietnam. To supply the insurgents, the North constructed a massive network of infiltration routes on land and at sea. The land route, eventually nicknamed the Ho Chi Minh trail, grew to hundreds of miles of roads, laboriously cut into the jungle through neighboring Laos and Cambodia. In some areas, the trail was built up to semi-improved highways crawling with Soviet and Chinese-supplied trucks. Every day—at its height—hundreds of tons of material made its way south. And for the Pentagon, stopping this flow of supplies was critical to blunting a growing anti-U.S. insurgency. With Laos technically neutral, the U.S. focused on air strikes. But seeing trucks under triple-canopy jungle was difficult, to say the least. “Secondary explosions” were often cited as evidence—speculation, at best—of hitting something. Targeting air strikes against bicycles or people under the same conditions was basically impossible. Physical barriers, acoustic sensors, miniature landmines and self-destructing caltrops were among the numerous ideas tested in the field. Others never made it past the development phase. Yet mud—wet, sloppy mud—emerged as another option. It was with such perversity in mind that the Pentagon began Project Popeye in 1966, an attempt to artificially extend the monsoon season in Southeast Asia. Between 1966 and 1972, Air Weather Service WC-130s flew over Laos, dispensing crushed, dried ice in hopes of creating floods along the trail and in agricultural areas of North Vietnam. But this early step didn’t work. No conclusive evidence was ever offered that the program was responsible for any significant changes in annual rainfall or the duration of the monsoon season. The program cost millions of dollars, and when it became public knowledge, was met with considerable criticism from Congress and the public. 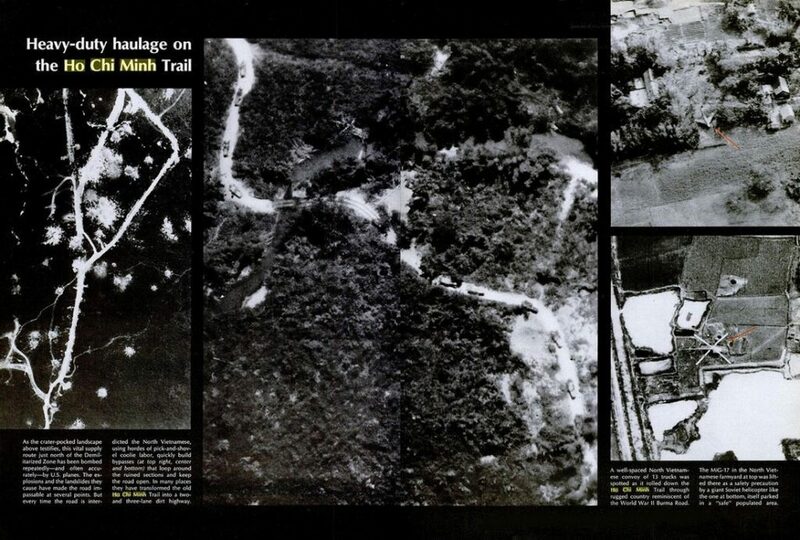 In addition to Project Popeye, the Air Force initiated Operation Commando Lava in 1967—another colorfully-titled effort to create artificially muddy conditions along the trail. Instead of weather modification, Commando Lava involved dispersing a mix of the chemicals trisodium nitrilotriacetic acid and sodium triphosphate that’s generally—and inaccurately—referred to as a “soap” or “detergent.” Though the major components of the mixture are commonly found in detergents and cleaning products, its primary function is to soften hard water. In May 1967, C-130s and aircrews from the Air Force’s 374th Troop Carrier Wing made the first drops over Laos. This involved loading the aircraft with pallets full of “the compound” in paper sacks and then simply rolling them out the back of the aircraft over the intended target. The sacks were expected to break up during the fall or disperse once hitting the ground. The exact results of this initial test are still unclear, but the program nevertheless continued. In July 1967, Operation Commando Lava II kicked off with additional drops in Laos and South Vietnam. The results of these drops were likewise inconclusive, and aerial assessments of the program proved just as hard to interpret as post-strike reconnaissance for bombing missions. The ground appeared soft and muddy, but there were no signs of a reduction in traffic along the roads. There was some suggestion that gravel or something else had been spread to harden the ground, or alternatively, rainy weather could have washed the chemicals away. The uncertainty in the results was matched by uncertainty in the program. Orders were given to observe the results of Commando Lava II operations, and for a report to determine the program’s fate. But Commando Lava was dead, and to this day, it’s little more than a footnote in most Air Force histories of operations against the Ho Chi Minh trail. It’s also hard to imagine such a harebrained scheme being repeated again. But no matter where people wage wars, there will very likely be mud.